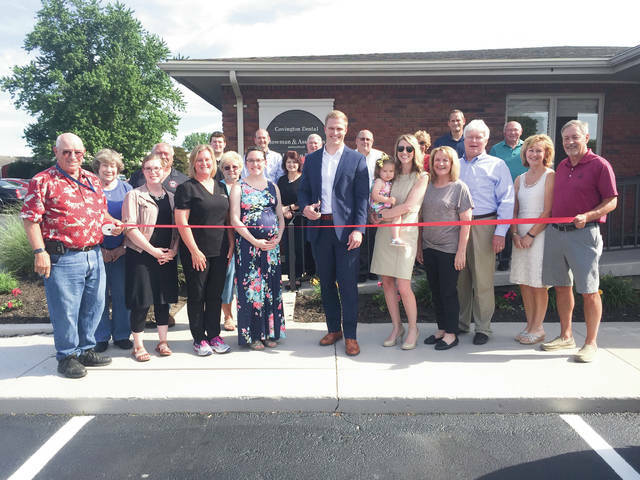 Provided photo Dr. Zach Stueve celebrates the opening of Covington Dental, 550 Mote Drive #1, with a ribbon-cutting, along with dental team and Chamber of Commerce members, and residents of the community. COVINGTON — Dr. Zach Stueve recently opened Covington Dental at 550 Mote Drive #1, in Covington. The event was celebrated with the dental team members, the Chamber of Commerce, and local members of the community. Stueve and his team are pleased to offer caring, comfortable, and comprehensive dental care utilizing advanced techniques and materials. The practice has state-of-the-art dental equipment, including soft leather chairs and digital radiographs to minimize radiation, providing both comfort and safety. They are excited to offer a variety of services focusing on general dentistry. The Covington Dental team is grateful for the support of their patients and community in welcoming Dr. Stueve into the community. Covington Dental looks forward to being a reason to smile. To make an appointment, please call (937) 473-2755.
https://www.dailycall.com/wp-content/uploads/sites/30/2018/06/web1_IMG_5402_cmyk.jpgProvided photo Dr. Zach Stueve celebrates the opening of Covington Dental, 550 Mote Drive #1, with a ribbon-cutting, along with dental team and Chamber of Commerce members, and residents of the community.